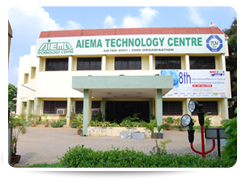 AIEMA Technology Center is a project of ATC Educational Trust (ATCET), which was formed to forge alliances with premier educational institutions. ATCET at present conducts B.E Part Time programme in association with Anna University, Chennai. The members of the AIEMA Technology Centre have formed this Educational Trust to organise technical course/degree programmes for the development of technicians and managerial staff in collaboration with Anna University, Chennai. ATCET also plans to further conduct short and medium-term courses in various disciplines. 2013-14 Sri.G.Venu N.A. Sri.Thomas K Varghese Sri.E.B.Joa N.A. 1985-86 Sri.N.Krishnan N.A. N.A. N.A. N.A.